Intex Above Ground Pool Installation Made Easy For You! 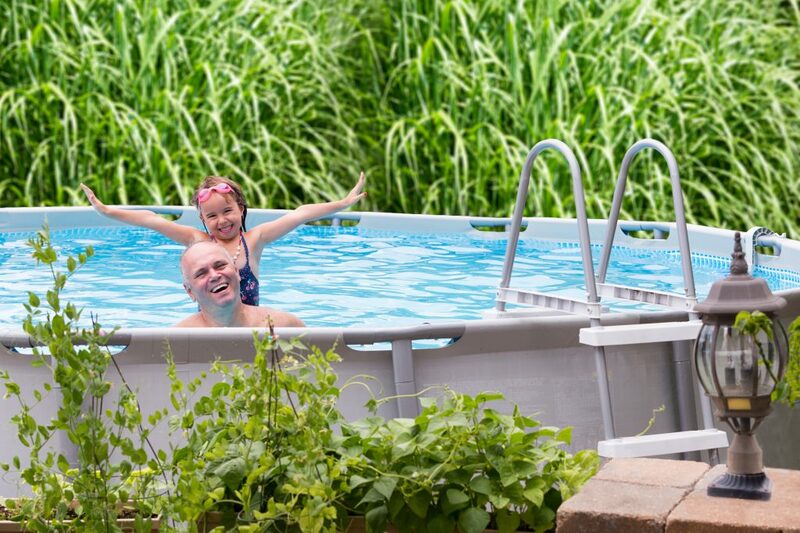 Intex is THE trusted household name in above ground pools. Now, we’re telling you exactly how to choose and install the right Intex above ground pool for your home. Summer: a time when families get together for backyard barbecues and, of course, splashing around in the pool. But maybe you have a small backyard, or you’re worried that an above ground pool is too expensive to install. An Intex above ground pool is moderately priced and easy to assemble. It comes in a variety of setups designed to fit your outdoor needs. And how do you set one up once you’ve bought it? Well, we’re going to answer these questions and more by looking at each Intex model individually and showing you how to install them. Easy Set pools are perfect for families who want to get in the water right away. Depending on the size, you can assemble them in as little as fifteen minutes and be ready to go. And speaking of size, this Intex above ground pool comes in a range of capacities from 8’x30″ kiddie pools to larger 18’x48″ models. It’s perfect for smaller backyards. It’s also great on your wallet since you can buy most Easy Set pools for under $100. You should know, however, that while you can easily store Easy Set pools, you do need a large space to do it. Easy Set pools are also known to have a weak liner and may be prone to leaks. If you decide that this Intex above ground pool is right for you, then you’re going to need to set it up. Fortunately, this part is pretty simple. Just follow these six steps toward hours of summer fun. Before you turn on the garden hose, you need to make sure you’ve got all the right materials to assemble your pool. It should come with the pool set, a filter, a pump, two filter hoses, a pool cover, and a ground cloth. Larger pools may also include a ladder for entry. If you find you’re missing parts, order replacements from Intex or exchange it at the store you purchased it from. It’s vital that you place this Intex above ground pool on level ground. Easy Set pools aren’t as sturdy as the Metal Frame or Ultra Frame models and may tip over if not placed correctly. You can use a shovel to even things out. Also, it’s not a good idea to place this pool under a tree. Not unless you want to clean debris out of your water constantly. Ok, so you’ve found the perfect spot. Now you’re ready to set up the pool. Lay out the ground cloth first. This tarp will help prevent punctures in the bottom of the pool. Put the pool set on top of the cover, ring side up, in as circular a form as you can manage. Unless you have the lungs of an opera singer, you’re going to need an air compressor for this next part. Inflate the pool ring until it is firm, but not hard. The summer heat will expand the air in the rings. Put in too much, and your pool could burst. Before you cannonball into the water, you have to assemble the filter for this Intex above ground pool. Your filter pump has two hoses: an intake that leads from the pool to the pump and an outbound that leads from the pump to the pool. Attach each to its corresponding socket and initiate the filter. Note: Make sure to establish a schedule. At night often works best. Never turn it on when people are in the pool. This step is where the fun begins. Fill your pool with water, making sure to distribute it evenly. The pool walls should rise as you continue to fill it. If your kids are impatient, you can have them jump in and iron out the wrinkles at the bottom. Once the water reaches the line at the base of the inflatable ring, you’re ready to swim. Easy Set pools are perfect for first-time pool owners, but if you’re looking to upgrade to something less flimsy, you might want to check out this Intex above ground pool. The rust proof frame ensures longevity and durability. Assembly is a snap, and you can choose from a wide range of sizes. Metal frame pools are bigger than the Easy Set, though, so it may not be the best for those with small backyards. Sizes start at 10’x30″ and go all the way up to 24’x52″. The only issue with this Intex above ground pool is that the stock filter may not be adequate for the size. You may need to upgrade it to something bigger. Like all Intex products, the metal frame pool is easy to assemble. Just follow these six easy steps, and you’re on your way. Always make sure you’ve got all the necessary parts before assembly. The metal frame set should include a pool liner, a filter pump, two filter hoses, a ground cloth, a pool cover, a ladder, end caps, horizontal poles, 3-hole joints, connection pins and leg supports. Double check the owner’s manual to make sure. Make sure you put your pool on level ground. If you don’t, you could set yourself up for a disaster. Get rid of rocks or other sharp objects from the area that could puncture the bottom of the pool. Your ground cover will further help prevent punctures and leaks. Be sure to spread it out thoroughly. Unroll the pool liner and place it right side up. Locate the filter holes and make sure they are in the position closest to where you will put the filter. NEVER drag the pool liner across the ground. You run the risk of tearing it. You may also want to leave the liner in the sun for a short while to make pole insertion easier. Slide one of the horizontal poles into the pocket of the pool liner. Keep doing this until you go all the way around the pool, making sure to go in one direction. Next, insert the 3-hole joints into the horizontal poles and lock them in place using the connection pins. Do this until you have made your way around the entire pool. Finally, slide the leg supports through the belt loops located on the side of the pool. Be sure to stay inside the restraining rope. Once you’ve got the legs in the loops, snap them into the 3-hole joints by aligning the spring loaded pins with the holes. Make sure everything’s in place and put end caps on the bottom of the legs. Before you add a drop of water, make sure to put the filter together. Attach each hose to its corresponding socket and turn it on. Once you’re sure it’s working properly, you can get out the garden hose. Once you turn on the hose, you can’t just leave it there. Fill the pool with about an inch of water. Make sure the water is level and iron out any wrinkles on the bottom (something you might want the kids to do). Continue to fill slowly until the water is just beneath the top of the liner. After that, you’re all set! Note: Proper maintenance is necessary to maintain water quality. To keep it clear you may want to use pool cleaning chemicals or invest in a robotic vacuum. If you’ve got the space for it, this Intex above ground pool will give you the best value for your money. While slightly more expensive than its Easy Set and Metal Frame cousins, the Ultra Frame pool is sturdier, more durable, and has greater longevity. It comes in two different shapes: traditional circle or the more contemporary rectangle. Sizes range from 16’x48″ for circular designs to 24’x12’x52″ for rectangular ones. If you’re thinking about buying this Intex above ground pool, you may also want to invest in a stronger ladder than the one provided. Intex has a reputation for easy to assemble products and the Ultra Frame pool is no exception. While you may have to do a little extra prep work, you can still put everything together in no time. By now, I think you’ve realized the pattern of the first few steps. Before you put anything together, you have to have the right parts. The Ultra Frame model comes with a pool liner, pool cover, ladder, a filter pump, filter hoses, end caps, T-joints, horizontal beams, and leg supports. Again, double check the owner’s manual. Like any Intex above ground pool, having the pool on ground that’s level is mandatory. Unbalanced water could shift the pool and cause it to tip. This preparation may take some extra work given the size of the Ultra Frame, but it’s worth the effort. Spread out the ground cover first to prevent punctures and leaks. Then, unfurl the pool liner right side up. Make sure you align the filter holes with the future position of the filter. Like the metal frame, you may want to leave the liner out in the sun for a short while to make beam insertion easier. Now it’s time to give your Intex above ground pool some legs. Insert the horizontal beams into the sleeves on the top of the liner, flat side up. Do this in one direction all the way around the pool. Next, pop in the T-joints by aligning the snap pins with the holes on the horizontal beam. Do this until you make your way around the pool. Now you’re ready for the legs. Slide them into the belt loops on the sides of the pool liner but inside the restraining rope. Then, snap them to the T-joints using the spring loaded fasteners. Double check to make sure everything is secure and that the filter holes are still in line with the place you want to put the filter. Assemble the filter by attaching the corresponding hoses to their correct sockets. If it’s running properly, you’re ready for the water. Break out the garden hose and let her rip. Slowly. Start off with about an inch of water to see if the pool’s level enough. Iron out the wrinkles and continue to fill gradually until the water is just beneath the top of the liner. Once the pool is full, dive in for a dip. Adults get to go on vacation, and the kids are out of school. To have the most fun this summer, purchasing a pool is an excellent investment, and nobody is better than Intex. An Intex above ground pool gives you the most for your money and ensures your family will have hours of endless good times. Interested in more outdoor entertainment? Got questions about pool pumps? Leave a comment below. We’re always excited to hear from you.